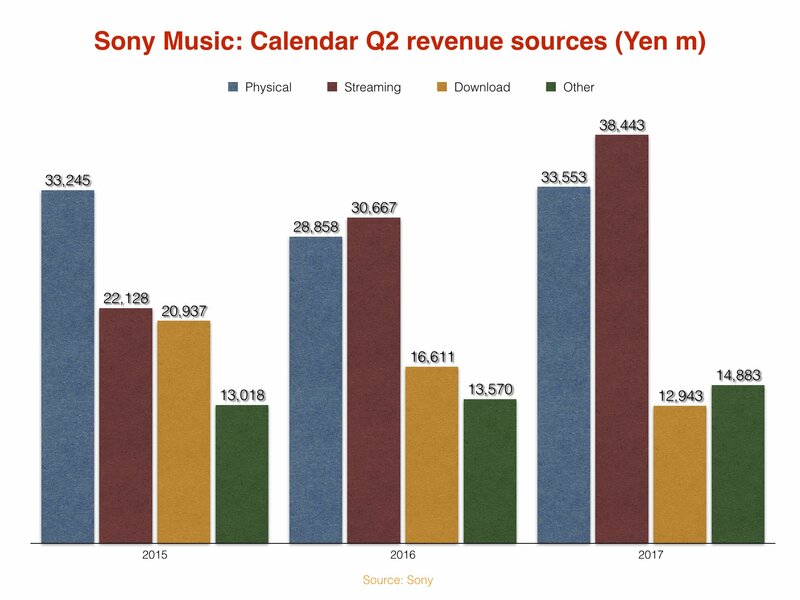 Sony’s record labels turned over 38.44bn Yen ($346m) from streaming in the three months to end of June, working out at approximately $3.8m per day. In real Japanese Yen terms, that represented a 25.4% rise on the same period in 2016 – while in US$ constant currency, it was up 22% (from $283.7m). But streaming (which in this case in includes on-demand services as well as digital radio, across both ad-funded and subscription) wasn’t the only star performer in the second quarter of 2017, which represents Sony Corp’s fiscal Q1. Physical formats (CD and vinyl) also saw a revenue bump, pulling in 33.55bn Yen ($302m). In real Yen terms that was up 16.3% year-on-year, while in US$ constant currency it was up 13.1% (from $267m). As expected, however, digital downloads fared much worse. The format generated just 12.9bn Yen ($116.5m) in the three months, down 22.1% in real Yen terms – and down 24.2% in US$ constant currency (from $153.7m). Sony’s total recorded music revenues in the period stood at 99.8bn Yen ($898.5m) – up 11.3% in real Yen terms, and up 8.3% in US$ constant currency (from $829.8m). 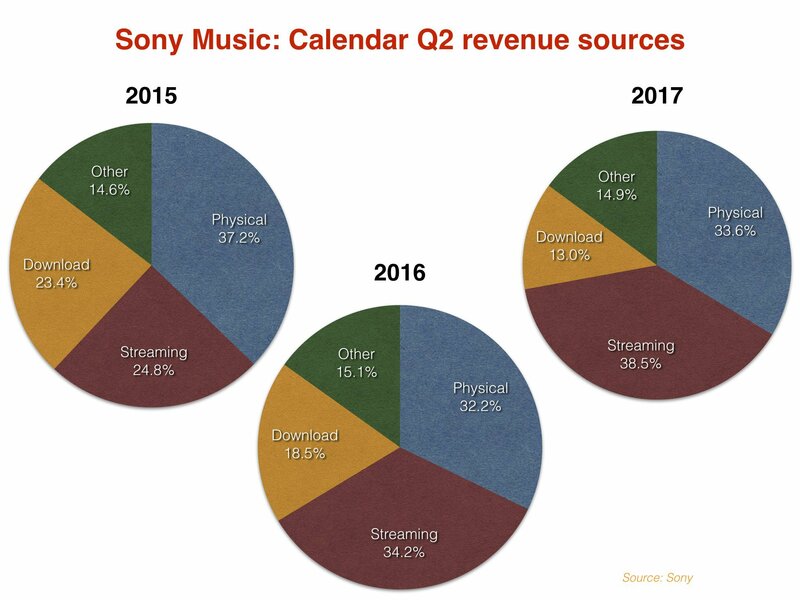 Overall, that meant streaming formats claimed 38.5% of Sony Music’s total recorded music revenues, with physical on 33.6% and download on 13%. Harry Styles’ self-titled debut solo LP (pictured) was Sony Music’s biggest commercial torchbearer in the period, pulling in more global revenue than any other project released by the major. Nogizaka46’s umaretekara hajimete mita yume was second, with The Chainsmokers’ Memories…Do Not Open at No.3. DJ Khaled’s Grateful was the company’s fourth biggest money-maker, with Rag N Bone Man’s Human rounding out the Top 5. Human outsold Future’s FUTURE worldwide in the quarter, despite the latter hitting No.1 on the Billboard 200 after its release in February. Sony Corp’s overall music division includes Sony Music Entertainment (US) as well as Sony/ATV and its Sony Music Entertainment Japan operation – plus revenues from EMI Music Publishing and the company’s ‘visual media and platform’ division. 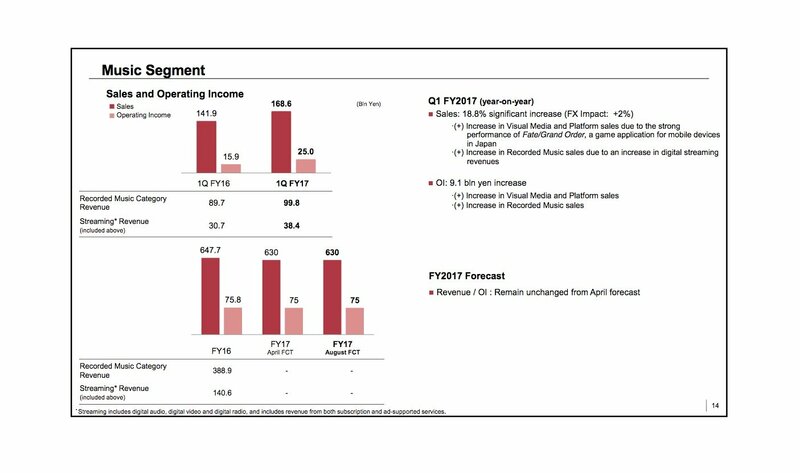 Incorporating all of these elements, Sony Corp’s Music operation saw revenues increase 18.8% year-on-year (+17% at constant currency) to 168.6bn Yen ($1.52bn). This jump in sales was mainly due to higher ‘visual media and platform’ sales – notably, mobile game Fate/Grand Order – as well as higher recorded music sales, led by Harry Styles. The overall operating income of Sony Corp’s Music division jumped 57.6% year-on-year to hit 25bn Yen ($225m). Note: MBW has reverse-engineered Sony’s recorded music financials from Japanese Yen into US dollars at the prevailing exchange rate of calendar Q2 in both 2017 and 2016 (Q2 2016: 108.1 Yen per USD; Q2 2017: 111.1 Yen per USD). This effectively gives us a constant currency picture of Sony Music’s performance. It isn’t a perfect system; it risks overplaying the major record company’s global business slightly by converting a chunk of revenues from Sony Music Entertainment Japan (which would usually be straight-reported in Yen) into US dollars.